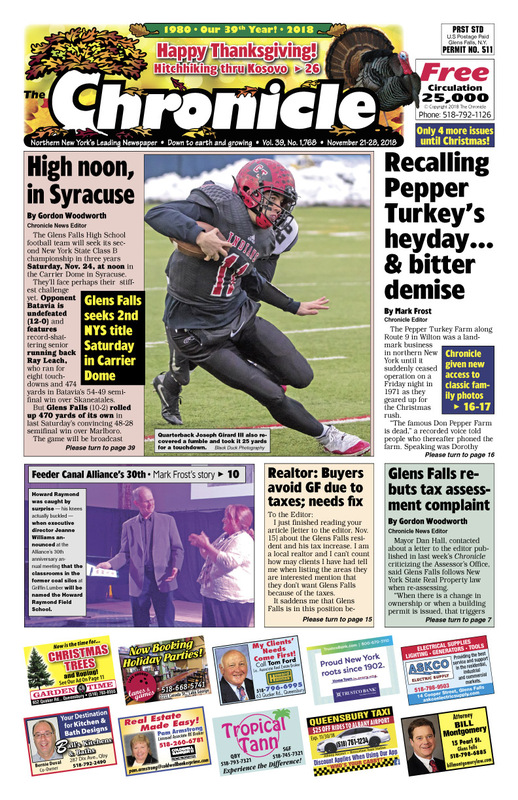 Thanksgiving issue | Glens Falls football, high noon, in Syracuse! Recalling Pepper Turkey’s heyday… & bitter demise. Feeder Canal Alliance’s 30th. TD Bank building sold to mystery buyer: $415,000. More on Glens Falls property taxes. Operation Santa Claus. Max & Kira, hitchhiking in the mountains of Kosovo. So many holiday events! Pages of real estate listings… Find your dream home! Concerts, comedy, shows… The Chronicle always has the region’s best Arts & Entertainment section!